We hold our Christmas Eve service at 6:00 PM so that families with children of all ages may enjoy its magic. The services lasts approximately one hour. 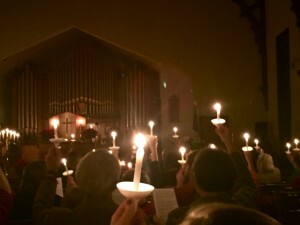 We blend the traditional service of lessons and carols with an extended time in the pure candlelight. This year we will hear a story about a birth by the light of the Christ candle, and listen to the gorgeous blend of voices of Betsy Alexander, Bridget Peters and Marcia Tomlinson singing a Christmas poem written by the great Victorian poet, Christina Rossetti. The choir will sing the stirring Bach chorale Break Forth, O Beauteous Heavenly Light and the congregation will sing a line-up of favorites like O Come, All Ye Faithful, Joy to the World, Hark! The Herald Angels Sing and finally Silent Night when we each are holding our candles in the pews. Randy Odell and Bridget Peters will sing again the bluegrass gospel song that moved many of us to tears on Pageant Sunday, Beautiful Star of Bethlehem. Organist John Atwood will play Christmas pieces by Buxtehude and J.S. Bach. Christmas morning we will worship at a special time, 10:30, so that the end of the service will fall closer to the start of the Community Christmas Dinner taking place downstairs at noon. We call this our Carol Sing and Favorite Christmas Things Sunday. It is a relaxed and informal service with a carol-sing by request, like the family gathered around the piano. You are also invited to bring a brief favorite Christmas story to tell, either personal story or a classic tale, or poems or quotes or songs—a kind of inspirational pot-luck. It is a wonderful way to spend the second half of Christmas morning, connecting to the hope, peace, joy and love that the day is all about. And then downstairs for the feast!